Measures Dirty Electricity (EMI) signals from 2 Kilohertz up to 10 Megahertz, a range that extends approximately 10 times lower and 20 times higher than the range covered by other dirty electricity meters on the market. Therefore you can be reassured that this Meter will detect levels of DE thoroughly and accurately. Simply plug the meter into any outlet to see how much DE/EMI is on the circuit near the outlet. After a few seconds the top reading will stop flashing and show an average reading on the circuit. Plug a dirty electricity filter (or more) into other outlets nearby and the meter will show the new level of DE/EMI underneath and the percent of total DE/EMI reduction with use of the filter/s. DE/EMI readings before and after dirty electricity filter/s installed in an outlet are shown simultaneously on the same display screen (in mV). ‘After filter’ display screen also shows the percentage (%-age) reduction in total DE/EMI between 2 Kilohertz and 10 Megahertz. The widest DE measurement range on the market. Includes special audio function – HEAR the difference! You can listen to the amount of dirty electricity on a circuit when the DE Meter is plugged in. (Similar to listening to microwave radiation levels when using the Acousticom 2 or the Acoustimeter Microwave Monitors. ) Hear the ‘noise’ decrease when you install the DE Filter/s (details are below). This DE Meter makes the correct placing and siting of the DE Filters very easy when trying to discern the best position (sockets) to place them to obtain the maximum results possible in reducing dirty electricity levels. Note: The first batch of Meters will come with a ‘stick-over’ label because we did not have our Branding sorted in time for the first production run! AVAILABLE TO ORDER @ £145.00! You can Order your DE Meter here – price: £145.00. NOTE 2: The DE Meter can only be used where your electricity supply operates at 200v-250v! Therefore it will not work in the USA/Canada or other areas that have a 110v electricity supply! So why should we be concerned about ‘Dirty Electricity’? In Dirty Electricity: Electrification and the Diseases of Civilization, epidemiologist Sam Milham, MD points out that the major diseases plaguing modern man — heart disease, cancer, diabetes, etc. 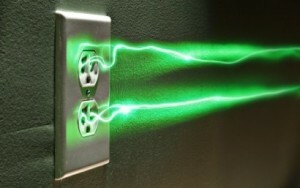 — may be triggered by a prevalent, yet nearly entirely overlooked, cause: dirty electricity. You generally cannot feel or touch electromagnetic fields (EMFs) and electricity in your environment, but it’s becoming increasingly clear that your cells are indeed impacted. ““Dirty Electricity” can … be used to describe electric power that has become corrupted by our use of modern appliances. Items such as CFL bulbs, cell phone transmission antennas, power supplies for portable computers, cell phone chargers, dimmer switches, variable speed fans and many other electronic devices that require a transformer to convert the voltage will “dirty” the electricity that enters your home. So now we know that we need a DE Meter to detect ‘Dirty Electricity’, and how DE can impact upon our health. But what can we do to remove it & help improve our health? 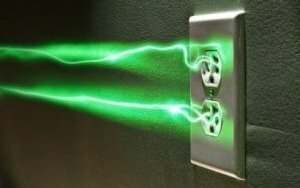 All we need are a few Dirty Electricity (DE) Filters plugged into our sockets to remove excess DE from our home’s and/or workplace’s electrical wiring system. The DE Filters need power so the sockets need to be switched on, but the DE Filters do not use any power, so your bills will not be affected in anyway. Fitting a few “Electropulse Filters” (or Dirty Electricity Filter) in your house helps reduce the Dirty Electricity (DE) levels by lowering high-frequency noise on your house wiring. They plug in (and occupy) a standard 13A mains power socket. 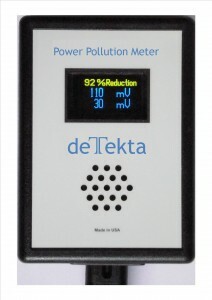 This whole process has now been simplified with our new DE Power Pollution Meter, the de Tekta. 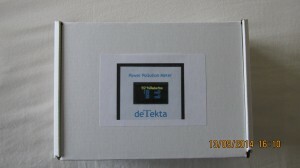 Correct placement of DE Filters, quantity and maximum reduction of DE Levels is now 100% guaranteed. Recommendations: We suggest a trying maximum of one-per-room and, in the first instance, probably just starting with two or three for the whole house. Typically a small Flat with one Socket Circuit would only require two DE Filters. A typical house with an upstairs and two Socket Circuits would require three DE Filters: two for the downstairs circuit, one in Lounge because this is generally where most of the electrical equipment is, and one in Kitchen. The third one is for the upstairs socket circuit. A larger house, one with more than two socket circuits, would require one more DE Filter for each extra socket circuit. However, always be guided by the DE Power Pollution Meter readings and percentage reduction achieved to determine the best results, placement of Filters and the total number of Filters required. You are looking to reduce DE Levels to around 100 mV or lower! Please note the new DE2 Filters replace the old DE1 Electropulse Filters and that contrary to what some other sites may advise, you do not need 10-20 DE Filters in a house! In fact this many would be counterproductive and may make the situation worse. Our Electropulse Filters (DE Filters) are manufactured in the UK and are designed to cope with our higher voltage system of 230-250v. Rather than being based on the US 110v system that other DE Filters are based upon. They are CE Marked, RoHS Compliant and 100% safe to use. Houses that are badly affected by internal DE would generally have DE Levels in the 400s/600s, and even higher, up to 1200 mV and above (into the 1800s) in some cases where Solar Panels are fitted nearby. The use of the DE Filters is designed to reduce these potentially harmful DE Levels (spikes of bad energy/information if you like) down to a more natural DE of 40-80 mV. Which is what you would expect from a 50-60Hz 230-250v system like the one we have in the UK. Though ideally what you would be looking for is a 90% reduction in DE Levels, or around 100 mV or lower. That is exactly what the DE Filters manage to achieve, with only 2-4 Filters. You DO NOT need to use more Filters than this unless you have exceptional circumstances of course, like polluted power coming in through the supply line, which the DE Meter will detect anyway. How To Use: Simply plug in the Filter to a socket and if the socket has a switch, switch it on. The Filters do not consume any power, though they do need to be ‘connected’ to the electricity to work. So rest assured your utility bills will not be affected. Check the new reading on the DE Meter and the percentage reduction in DE achieved. Once you manage to reduce the DE Level to around 100 mV – or lower if possible – then you do not need to use any more DE Filters. **Please note that DE Filters don’t lower the power frequency electric fields created by house wiring, only the high-frequency noise between the 230 volts phase and the neutral. Technical detail: The unit contains a 15 microfarad a.c. mains-voltage rated capacitor and discharging resistors. The units are fully approved to European safety standards and are internally fused and shielded unlike others on the market. What is Dirty Electricity (DE)? Dirty electricity (DE), also known as dirty mains, dirty power, or electrical pollution, is a term that describes the problem of electromagnetic noise being on the mains wiring of a house, when it isn’t supposed to be. DE occupies a part of the spectrum in-between the power frequency fields created by powerlines and substations, and the microwaves produced by mobile phone masts and other modern wireless devices. Many claims have been made associating Dirty Electricity with a wide variety of negative health effects, including cancer, asthma, chronic fatigue syndrome, diabetes, ADD, autism and a number of neurological disorders. DE consists of high frequency “electrical noise” that has become superimposed on your wires. It includes transient spikes from inductive loads like motors being switched on and off. Most of the published work on this uses the Stetzer Microsurge meter which measures noise between about 2 kHz and 120 kHz. Until now the only DE Meter available. We can now offer a modern state of the art DE Meter which measures DE between 2 KHz & 10 MHz. See above for details. dLAN network adapters also put RF signals on your mains wiring and it is good to switch them off at night. The levels are vanishingly tiny when compared with WiFi signals, however they may affect electrosensitive people. Please note: dLANs use frequencies above 150 kHz and are not detected by the Dirty Electricity meter. Common large contributors to DE include Solar Panels, Smart Meters, dimmer switches, televisions, fluorescent light bulbs (including the relatively new CFLs, or energy efficient bulbs) and computers. Electrical (Chair) Recliners and Electrical Adjustable Beds also create very high levels of DE through the Transformers used to convert the ACV to DCV. Any device that has a “switched mode power supply” will naturally create a lot of noise, but it’s hard to tell exactly which devices do have them and which ones don’t. It’s fairly new technology, so most modern, energy efficient, electronic devices now have them. Older, non-electronic devices such as lamps, ovens, or devices that run on motors, don’t normally create much DE. Your electrical supply is supposed to have just a 50 Hz sine wave on it, but this is rarely the case. There are almost always significant 2nd and 3rd harmonics (100 and 150 Hz in Europe, 120 and 180 Hz in USA), but these are not thought to be any more harmful than the pure sine wave. DE consists of high frequency “electrical noise” of 1000 Hz (1 kHz) and upwards that has become superimposed on your wires. It includes transient spikes from inductive loads like motors being switched on and off. Most of the published work on this uses the Stetzer Microsurge meter which measures noise between about 2 kHz and 120 kHz. dLAN network adapters also put RF signals on your mains wiring and it is good to switch them off at night. dLANs use frequencies above 150 kHz that extend up to several MHz and are not detected by some Dirty Electricity meters like the Stetzer. However, the NEW DE Meter we have just launched (see above) will be able to measure these levels. It will measure DE from as low as 2KHz up to 10MHz. High speed/bandwidth (500 Mbps and faster) dLANs produce electrical RF noise up into the 100s of MHz. High frequency noise on electricity supplies is a problem that has been know about since the 1920s. The original suggestion for a general use meter came in the 1980s from a Professor of Electrical Engineering in the USA called Martin Graham. He filed a US Patent that suggested possible circuitry for a suitable meter and the theory behind it. Working with Dave Stetzer, who runs an electrical company in the USA, he then produced a practical meter. It is measured in what have become known as GS units. The term DE units is usually taken to have the same meaning. The capacitance of a human to the live wires will usually be less than 800 picofarads and the current through the human will be proportionately lower. The current flow through the human will also depend on how the capacitance of the human to the wire is distributed over the person. This is important since it is the current flowing inside the body and where it is flowing that determines the effect it will have on the human.